Do you care about your health or that of your family? Do you know what is in the food you buy and eat these days? We all know that food and health are totally related. We also know that eating good, nutritious food is an essential part of staying healthy. What many people DON'T know however is just how many chemicals and other substances are added to many of the foods we eat on a daily basis. Nor the effects that many of these can have on our health. The ADDITIVES UNCOVERED: What's in your food and how it affects you eBook lists all the food additives in use in the USA, Europe, Australia and New Zealand and allows you to understand why they are there; and more importantly, what they mean to YOUR health. Do you really understand the labels on the packaging? So you take a peek at the label and suddenly you find that you have to make sense of any combination of thousands of names for the substances that are added to our foods. Any given food additive can appear under many different names and guises; including various chemical names, E-codes in Europe or numerical codes in Australia/New Zealand. What’s even worse is that some may not even be declared on the label at all. 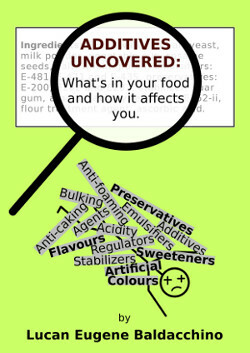 ADDITIVES UNCOVERED (What's in your food and how it affects you) allows you to easily locate and understand all the food additives, however they may be declared on the label. “Hang on”, I hear you cry. Surely the manufacturers know what they are doing? And what about the authorities; aren’t there laws to protect me? Well, while the short answer to both of those questions would be YES and YES, things just aren't so simple these days. ...it’s still not clear-cut. Yes, there are additives that are universally bad for everyone. However the age-old expression “One man’s meat is another man’s poison” has also never been more true, because there are also additives that are perfectly fine for someone else but may in fact still be harmful to you. ADDITIVES UNCOVERED answers all your questions on food additives. 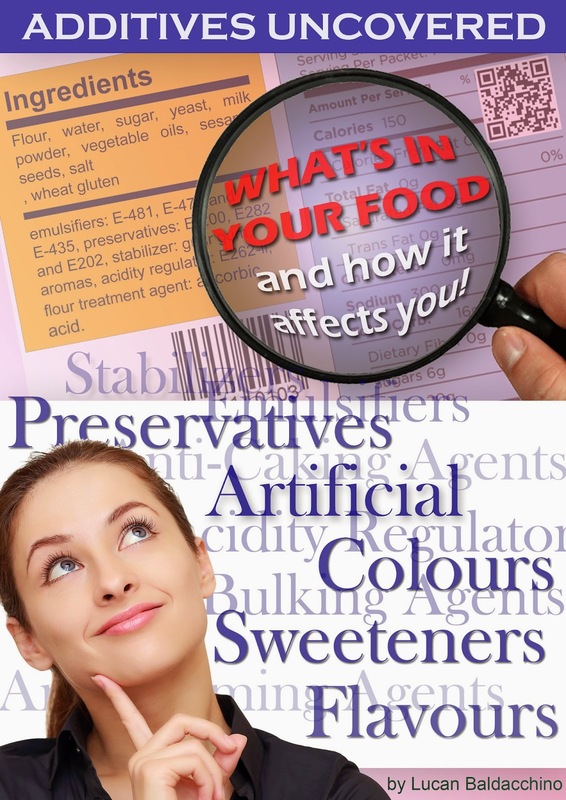 The eBook also uncovers all the secrets of the food additive business. ...LOOKS GOOD – that means it must have the right colour. After all you wouldn’t want to buy orange juice that was brown in colour, would you? WOULD YOU DELIBERATELY BUY ANYTHING THAT COULD BE HARMFUL TO YOU OR YOUR FAMILY? Again, what is good and what is bad? ADDITIVES UNCOVERED will painlessly take you through this maze and show you what your products contain and which of these additives you should avoid. However, included in this group are some really bad guys. But once again, how do you tell? We’ve already seen that it isn’t always quite as simple as saying this one is good while this one is bad. The fact is that answers frequently depend upon so many personal circumstances. ADDITIVES UNCOVERED will take you by the hand figuratively and help you to determine for yourself what is suitable for you and your family’s personal circumstances. This is not hard to believe once you know that some manufacturers can even add substances to their products that make you crave them more by getting your brain-cells addicted. Far too many of the food additives in the food we eat these days are quite frankly not good for any of us, while many can actually be bad for those with particular health conditions. And it doesn’t just stop at health issues. It’s so easy to inadvertently consume additives that go against personal or religious beliefs. Vegans, vegetarians, those on Halal or Kosher diets are all at risk. ADDITIVES UNCOVERED looks at individual circumstances to determine when or whether you should or should not consume a particular additive as well as providing watch-lists, tips and suggestions to help you make better choices for you and your family. IT REALLY PAYS TO UNDERSTAND THE LABELS. OK, so what about those authorities that protect us? The fact is that authorities world-wide don’t always agree on what is good or bad for you – so there is no universally followed policy. Sure there are guidelines, but it’s entirely possible for an additive to be stated as being OK in the USA but happens to be banned in Europe or the UK. HOW CAN THE SAME ADDITIVE BE BAD IN ONE COUNTRY AND GOOD IN ANOTHER? Even when the scientific advice is perfectly sound, and vast amounts of medical research indicate that a food additive is potentially harmful to us, final policy decisions most often than not fall to Governmental authorities who then may also have economical or political pressures to consider. ADDITIVES UNCOVERED will easily take you through the problems no matter where you live and tell you straight what is wrong with any additive and what affect it can have on you. And ADDITIVES UNCOVERED will provide YOU with a strategy that fits your own requirements. IS THERE A MEDICAL CONDITION TO CONSIDER? For example, if you have a heart problem, don’t you NEED TO KNOW whether what you are eating is harming you? Or if someone in the family has a predisposition to getting cancer, would you not want to know what additives to avoid? IT IS BETTER TO PREVENT THAN TO LATER LAMENT. ADDITIVES UNCOVERED identifies clearly and easily what you should avoid for these and many more conditions. All of this is based upon medical research from all over the world. Wouldn’t you want to know whether recent research indicates that you shouldn’t ingest a particular chemical because of its discovered dangers? Shouldn’t you know that an additive is banned in one country yet approved elsewhere? Will you risk your health unnecessarily? ADDITIVES UNCOVERED helps you address these issues, providing you with clear-cut strategies for dealing with these and other problems. I’M A VEGETARIAN… What do I need to know about the food additives that I eat? I’M A VEGAN… What are the differences for me in what I should not consume compared to a Vegetarian? MY RELIGION ABSOLUTELY FORBIDS THE CONSUMPTION OF CERTAIN THINGS… How do I know which food additives are permissible for me to eat if I am on a Kosher or Halal diet? MY CHILDREN’S BEHAVIOUR IS UNCONTROLLABLE OR THEY ARE DOING BADLY AT SCHOOL… How do I know if what I am giving them to eat may actually be harming them, causing temper-tantrums, or even affecting their learning ability? AM I POISONING MYSELF WITHOUT KNOWING IT?… How can I tell if any food additives are actually harmful? Do I really understand the labels on the packet? ADDITIVES UNCOVERED can provide you with everything you always wanted to know about food additives in a way that is easy to understand and quick to use as your reference book on a daily basis. When you are an informed shopper, you can make better decisions affecting your purchasing choices. Deals comprehensively with all food additives in use throughout the USA, Europe, Australia and New Zealand. Has an easy to use system that allows you to see at a glance whether each additive poses a potential threat to you, your children, or is against your beliefs. Lists and cross-references the multiple names for each additive to make it easy to quickly identify any additive no matter where you live. Examines every single additive in detail and provides recommendations to meet the needs of all consumers. You’ll discover what products are likely to contain certain additives as well as easy to remember guidelines to make shopping easier. Offers lists, tips and suggestions to cater for many different health problems, dietary concerns, children, beliefs and more. Allows you to increase the power you have over food marketers as well as your own health. Is packed full of interesting anecdotal snippets as well so it is not only informative but also fun to use.